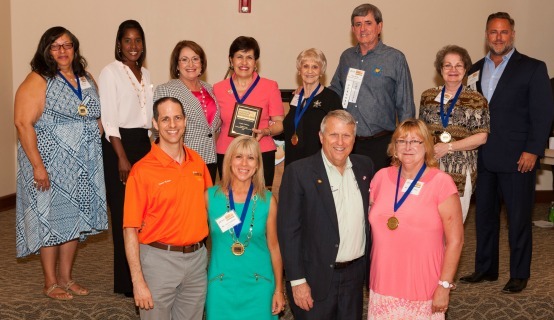 Orange County Mayor Teresa Jacobs and the Board of County Commissioners recognized several Community Champions and the Distinguished Citizen of the Year at the 21st Annual Community Conference held on July 9 at the Renaissance Senior Center. Lizette Valarino was honored with Mayor Jacobs’ 2016 Distinguished Citizen of the Year award. Valarino served as a Special Assistant to previous Orange County Mayor Rich Crotty and Chairman Mel Martinez and is a tireless, effective advocate for the Hispanic community in Orange County. While serving under Chairman Martinez, Valarino founded the Hispanic Heritage Committee of Greater Orange County, which coordinates Orange County’s annual Hispanic Heritage Celebration, scheduled from September 15 through October 15. The event encourages the community to learn about Hispanic history and culture. Valarino also established the Hispanic Heritage Scholarship Fund of Metro Orlando in 2000. The fund has provided more than $1 million in scholarships to more than 270 local Hispanic students. Valarino is also an active supporter of the Orlando Ballet, the Dr. Phillips Center for the Performing Arts, the Florida Opera Theater and local arts. District 1 – A resident of Williamsburg for more than 30 years, Donna Finklestein is an active leader in her community. Her interactive approach toward communication has resulted in traffic improvements that will positively impact Williamsburg residents. She strives to keep communication channels open and assists the District 1 office in disseminating information within the community. District 2 – Debbie Turner founded a Cancer Care and Resource Center in 2007. By working with the American Cancer Society, she has been able to lobby in Tallahassee and Washington, D.C. for cancer legislation, funding and research. Her organization provides educational services, transportation, counseling and support services. Turner is a retired Orange County Public Schools teacher and a volunteer and counselor for First United Methodist Church of Apopka. District 3 – Jo’An Rice served as President of the Pine Castle Safe Neighborhood Association. She spearheads efforts to solicit interest and motivate community members to join her in creating activities that promote safety and enhance the visibility of Pine Castle. She is also an active volunteer on many boards that promote unity within the community and throughout Pine Castle. District 4 – Lisa Franchina serves on the Board of Trustees for the Orange County Library System and the Board of Directors for Orange County Animal Services, League of Women Voters of Orange County, Central Florida Chapter of the National Association of Women Business Owners, Back to Nature Wildlife Refuge, Cypress Springs Homeowner’s Association and the East Orlando Chamber of Commerce. She is a member of several other chambers of commerce. Franchina is considered a strong leader in both the residential and business communities. District 5 – President and CEO of the Winter Park Chamber of Commerce, Patrick Chapin advocates on behalf of Winter Park residents, business owners and visitors. Each summer, the Chamber hosts a youth leadership program for high school students to encourage active citizenship and to help them develop new leadership skills. Chapin is also dedicated to increasing awareness and research for Sanfilippo syndrome, a rare metabolism disorder. Through several Ironman triathlons, he waves a purple “Courage” flag for his niece, who is affected by the disease. One of his most recent contributions was his decision to donate a kidney to a friend in need. District 6 – A resident of Holden Heights, Dedra Jenkins helped create the Holden Heights Neighborhood Watch Program and Holden Heights Neighborhood Association. As a result, the community has witnessed improvements such as new community signs, a community park, streetlights, sidewalks, sewer lines with a new drainage system and a new community center. The annual conference strives to educate and assist citizens on how to revitalize their neighborhoods and make them the best possible places to live. Citizens, community leaders, homeowner’s association leaders and nonprofit organizations came together during this event to share ideas about improvements that can be made in their counties. The 2016 Community Conference is hosted by Orange County’s Neighborhood Preservation and Revitalization Division. The annual conference provides valuable information about County services and programs that can help neighborhoods thrive and prosper. Workshop topics included information on neighborhood grant opportunities, code enforcement and social media. To view photos from the 2016 Community Conference, visit Mayor Jacob’s Flickr album.